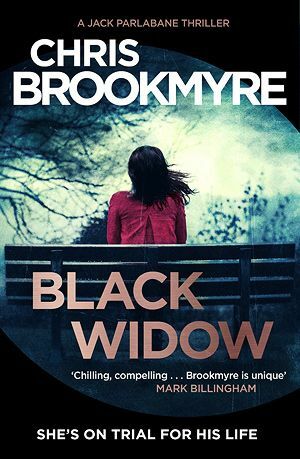 There’s a certain sense about Scottish thriller writer Chris Brookmyre’s new book that weighty ‘Issues with a capital I’ are being explored, so heavily does it resonate with subject matter of its time. His thematic threads are nicely tied together, and all more than worthy of exploring; briefly, the book follows the court case of Diana Jager, either a strong and confidently successful female surgeon or a scheming and possibly psychotic manipulator, who is accused of the murder of her husband. Jager has suffered too, though, at the keyboards of those who attacked her with misogynist abuse and threats following the hacking and outing of her blog about sexism in the medical world. Into the story steps Brookmyre’s most-used lead character, rumpled investigative reporter Jack Parlabane, and much of the book switches between his perspective and Jager’s. This latter point of view is crucial; as much as Brookmyre is dealing with subjects that deserve to be pinned down by storytellers, male or female, the danger of mansplaining as a male writer is surely strong. Yet he has an ex-journalist’s facility for picking away at the heart of a story and focusing on seemingly disparate clues and character traits which compellingly create a bigger picture, and his treatment of Jager doesn’t feel forced. As ever, he’s created a solid, briskly paced thriller with a sense of confident contemporary relevance. Out now, published by Little, Brown.